It was time for a new look in my home sewing studio. The room is right off our living room and it was just calling for fresh art work. The laser-cut fusible appliqués were the perfect solution—a quick resolve! I wanted to use the fusible, laser-cut appliqués with the words Sew and Fabric, Cut, Stitch, Create. These appliqués are precisely cut by laser from black Kona cotton fabric. I knew they’d make a statement! The packaging lists the size of the stretched canvas used for framing. These frames are available at craft and art stores. You’ll find them in the oil painting supplies section. For this example, a 24″ x 12″ canvas is recommended, the perfect size for the Sew laser cut fusible appliqué. The canvas has a 1-1/2″ side depth. Cut a fabric rectangle 6-1/2″ wider and longer than the size of the canvas. The fabric was cut 30-1/2″ x 18-1/2″. If your canvas has a narrower depth, 3/4″, scroll down until you see the Simplify framed art photo. Dimensions and instructions given there are the narrower width of canvas. Back the fabric with a fusible interfacing, such as ShirTailor. Note from Nancy: The extra stability provided by the interfacing gives a crisp, professional look to your framed artwork. Don’t skip this step! Serge or zigzag the edges of the fabric. Using a ruler, mark and cut out a 3″ square from each corner. To see more options on framing laser-cut appliqués, click here. Position the appliqué to the fabric. Take time to be accurate! Use double-sided basting tape to attach the fleece sections to the canvas. It’s important to have this padding on top of the stretched canvas. Fold the fabric at each corner, aligning the cut edges and right sides. Sew or serge with a 1/4″ seam allowance. Turn the artwork right side out. Press the seams open. Slip the fabric over the canvas. It will be a snug fit. Fold the excess fabric to the underside of the canvas frame. Fold miters at the corners; staple. Note from Nancy: Make sure that you’re slightly stretching the fabric evenly. Take time to check the front image to make sure that the fabric is not distorted. 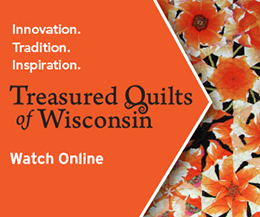 Whether you sew, quilt, embroider, or decorate with fabric, these four words tell your story! Here are the quick steps to creating this wall art. Purchase a picture frame and disassemble the components as adding a picture. Cover the cardboard with fleece. Remove the appliqué from the packaging. Look for “tabs,” extra fabric between the letters that keep the appliqué stable in the packaging. Snip out tab connectors, it will be obvious. Cut fabric 4″ larger than the cardboard; back with fusible interfacing. Wrap the fabric around the cardboard. Secure in place with duck tape, then replace the cardboard into the outer frame. For a chance to win one of my laser-cut fusible appliques, tell me which appliqué you’d use to decorate one of your rooms. The random winner of the Hot and Handy Projects book is Savannagal. Her comment was: What an awesome giveaway. I love all the ideas in this book. Sadly, I’ve looked for quilted fabric in my area and have only found a couple of choices. I’ve never seen the Quilted Iron Quick fabric or anything like it anywhere. Nancy’s Notions has even put together a great package deal. Check this out! Content in this feed is © copyright 2014 by Nancy Zieman and may not be republished without written permission. You’re welcome to forward the email to a friend or colleague but it’s not okay to add the RSS feed automatically as content on a blog or other website. I purchased “sun soil seeds sprouts” to make something for my daughter. She is just getting her masters in biology/ecology and she nicknamed her youngest son “Sprout.” That applique had to be made for her! Naturally, I’d love to have the “Family” laser cut applique. I would chose “Kindness” because the priest who married my husband and I (almost 17 years in August) gave the wise words….Kindness….Kindness….Kindness! It reminds me of my wedding day and lifetime commitment! Thanks Nancy for being my inspiration through your blog! I’d choose the word Family with the tree because that is what is most important to me, family and faith. I like the big pin cushion with sew on it. The chocolate one is tempting, but I am afraid it would just remind me of what I should stay away from. They look like they would brighten up any spot. Thanks for showing us how to make it. Souls love the SEW pin cushion Thanks for the instructions on how to use the appliqués . Thanks for the tutorial on how to use the great laser cut appliqués. I have a hard time picking one but the SEW pincushion is nice. I’d choose the ‘Be Thankful’ design, and put it in my foyer so I’d see it every time I leave or enter my home. I sometimes forget to be thankful in the course of a day for all the many blessings I have. A reminder would be most enjoyed. Thank you for the excellent tutorial! I love the “Sew” with the pin cushion! Thanks for sharing your ideas. I love them all! Any would be a treat! First choice would definitely be “CREATE” because it covers all things creative. Second choice would be “MEASURE TWICE, CUT ONCE”. fabric cut stitch create wraps it all up for me! Would love Measure twice cut once. Have had a few problems with this. Also like Welcome to our home. “be thankful” because every day is a gift and we always need a little reminder to be thankful…. I would love the Sewist Applique. They are all wonderful, I may have to start a collection. I love the Coffee applique. Sew. Most certainly. Because that’s what I do. These fusible appliques are easy to use and work really well. I love the SEW one. “SEW” would be appropriate for my room. SEW are my initials and I love to sew and craft. “Measure twice cut once” boy I definitely need to see that before I pick up the rotary cutter! Measure twice, cut once sums it up for me and my fabric, and for my husband with his wood-working adventures! I would like the Quilt one for my sewing area. I love the one Measure Twice, Cut Once! My husband and I not only sew together but sometimes do woodworking projects together…..I have made a few mistakes w/o measuring twice. Lesson learned? I love them all ! I have the Sew one and the Quilt one in my sewing room, which doesn’t look as tidy as yours. Hard to choose. Leaves of virtue set is great! To choose one it would be patience. Sewing is 99 per cent patience. Although I love them all, this spoke to one of my frequent mistakes and I might as well put it on the wall to remind me again and again! I would love to have the “family” tree design. If I ever want to make a dent in my ever growing stash, I look for simple patterns that only look complicated. I so enjoy all your offerings……it is ‘sew’ great to have information plus the ability to purchase what is available on the market w/o having to search all over. Thank you. I love all of them, as others have said, but my favorite would have to be “Happiness”. My sewing room is a bedroom that is a shared space. It is used for exercise, so there is a treadmill and a weight machine in the room, as well as my sewing/cutting table, my wonderful Babylock Ellegante, my BabyLock Serger, my Babylock Embellisher, and and of course the iron and ironing board..can’t forget that! I would love to have the Happiness applique because without happiness, I’m not sure my husband and I could share this room with such warmth each day as I sew and he exercises. (guess you know by now which one of us is the most healthy). I would like “Family” It would look great among family pictures on the wall. Sew would be my favorite I love the. All. I think I would choose create, since it can be so many more things then just sewing. I love to quilt, but I also like many other crafts, so create would fit me to a tee! I like them all but “Welcome to our home” is beautiful. Thank you for your years of teaching and of course being able to watch and learn each week from your shows. I would use the “Fabric-Cut-Stitch-Create” fusible applique. My grand daughter is seven and she loves to identify new words. She already knows the concepts of these words because we spend a lot of time together in my sewing room! And she’ll be “applying” these concepts to her own creativity as well! I love them all, but I would pick Happiness. I’d love the Sew, Cut, Stitch, Create for my sewing studio. I need wall hangings to spruce it up. It’s in a new house & I didn’t have a studio before & now I really need some decor to have a finished look. Thanks for the opportunity. I would love the package deal, I could do many projects with that one. Fabric Cut Stitch Create says it all. Thanks. LOVE your laser cuts,looking through them really has the creative juices flowing!! If chosen I would pick the small “sew”, I see it in a small frame,clothing,pillow cases and the list goes on and on. Thank you. I need the Christmas one to update my holiday decor. They are all great..would pick… Read Relax Enjoy Learn…. Leaves of Virtue Fusible Applique Set would be so cute in the nursery of my granddaughter! I think encouragement is always good for any baby and a great reminder for us all! Will be redoing my 16 x 20 studio, new work tables, sewing cabinets, storage, etc. Would love any and all. I would use the “sew” applique. I have a closet studio, so it would fit perfectly. SEW yep – that sums it up nicely. The small sew….just right for a gentle nudge. I like the Fabric Cut Stitch Create – it reminds me of a baby quilt I did which had applique that said Eat, Play, Sleep, Repeat. I love these! What a great idea. Either of these would work in my sewing/craft room since that is what I do. Currently I have words made from die-cut letters from my scrapbooking supplies that I decorated and “stuck” to my walls. Lots of words; imagine, sew, create, quilt, knit, and more. I love the one entitled “Family” as it could be used in so many ways – heritage, picture/memory, anniversary or birthday quilted hangings. It would definitely be a keepsake work of art. …DEFinitely the “Fabric Cut Stitch Create” laser cut fusible applique! Those words DO tell my story.The precision of the laser cut letters makes these two projects so doable with a much cleaner cut than with my scissors! And I have an ombre piece of fabric that would be perfect! Thank you for the tutorials and for the chance to win! Fabric, Cut, Stitch, Create would look great in my sewing room. “SEW” is the one that would work well for my space. I really enjoyed learning about this idea.